John Wayne was born at 1:00pm-CST, in a small two-room home in Winterset, Iowa. He weighed 13 pounds at birth. The home still exists and has been a museum dedicated to John Wayne for many years, as well as a popular tourist location for Wayne fans from around the world. Plans are currently in the making to build an even larger John Wayne museum and theater nearby. There has long been some confusion as to John Wayne’s actual birth name. Some claim it was Marion Mitchell Morrison, other claim it was Marion Michael Morrison, and yet others say it was Marion Robert Morrison. John Wayne’s birth certificate, which is on display at the John Wayne Birthplace Museum in Winterset, Iowa, shows that his birth name was Marion Robert Morrison. When John Wayne’s brother was born, he was named Robert Emmett Morrison, and Wayne’s mother changed Wayne’s middle name to Michael (or so the story goes), or she may have changed it to Mitchell (as other stories go). The fact of the matter is, however, that his name was never legally changed. He was born Marion Robert Morrison, and that was his legal name throughout his entire life. John Wayne had seven children. Four with his first wife Josephine (Michael, Antonia [Toni], Melinda, and Patrick), and three with his third wife Pilar (Aissa, Ethan, and Marissa). Wayne and his second wife Chata had no children. John Wayne is the grandfather of actor/stuntman Brendan Wayne and country singer Jennifer Wayne. He is also (allegedly) the great-uncle of boxer/actor Tommy “The Duke” Morrison. While at the University of Southern California, he was a member of the Sigma Chi fraternity. According to Tim Tessalone, USC Sports Information Director, John Wayne's jersey number while he played at USC was 24. In his leisure time, John Wayne enjoyed playing chess, poker and bridge, and was quite accomplished at all of them. John Wayne’s favorite drink was Suaza Commemorativo tequila. John Wayne holds the record for the actor with the most leading parts - 142. In all but eleven of his films he played the leading part. John Wayne was an honorary United States Marshal. Only two others have been accorded that honor - Ronald Reagan and John Walsh. Many people thought he didn’t have much of sense of humor. Not true. He loved practical jokes, and his appearance on "Rowan & Martin's Laugh-In" wearing a fluffy pink bunny costume should have laid to rest any doubts about his sense of humor. John Wayne’s production company Batjac was named after the shipping company featured in the film Wake of the Red Witch. In the film, the company was called Batjak, but a typographical error made when Wayne’s company was being created spelled the name Batjac, and the spelling was left as such. Wayne received his stage name of John Wayne from director Raoul Walsh when Walsh cast him in his first starring role as Breck Coleman in The Big Trail (1930). During the location shooting of 1930’s The Big Trail, the cast and crew travelled to Wyoming. The location was quite primitive and the only lodging available to them were a couple of trappers cabins. The crew set about building more cabins (which would be needed for specific scenes as well as lodging), and Wayne helped build some of those cabins. The site later became the town of Moran, Wyoming. Politically active, he actively supported and campaigned for both Barry Goldwater and Ronald Reagan, and he addressed the 1968 Republican National Convention. In 1953, John Wayne accepted the Academy Award for “Best Actor in a Leading Role” on behalf of his close friend Gary Cooper. Cooper won the award for his role as Marshal Will Kane in High Noon, a film which Wayne personally did not like. During the filming of The Undefeated in 1969, Wayne fell from his horse and suffered three broken ribs as well as torn ligament in his shoulder which prevented use of that arm. He refused to stop working, however, being concerned that he might disappoint his many fans, and in spite of intense pain, he continued to work. Because of this, Andrew McLaglen, the film’s director, could only film Wayne from an angle for the remainder of the shooting. Well known as a practical joker amongst his close friends, Wayne and Ward Bond were constantly trying to one-up each other. In one instance, Bond bet Wayne that if they both stood o the same sheet of newspaper, Wayne would not be able to hit him. Wayne took the bet, and Bond placed the newspaper on the floor in a doorway. As Wayne stood on his end of the newspaper, Bond closed the door and stood on his end of the newspaper (on the other side of the door) and shouted “Try and hit me now!” Not wanting Bond to get the upper hand, Wayne slammed his huge fist right through the door and knocked Bond to the floor. Wayne won the bet. John Wayne repeatedly acknowledged his close friend and mentor John Ford as being responsible for his success in motion pictures. They spent many hours together over the course of their lives, and much of that time was spent aboard Ford’s yacht, Araner. In 1973, John Wayne released a spoken word album for RCA Victor. The album was titled America – Why I Love Her. It was a hit and John Wayne won a Grammy for it. After the terrorist attack on September 11, 2001, the album was re-issued and once again became a best seller. John Wayne has appeared on three United States postage stamps. The first was released on March 23, 1990, and was part of a four commemorative stamp set honoring classic films. Wayne appeared on that stamp as the Ringo Kid. On September 9, 2004, Wayne was honored with his own stamp and due to be released in 2012 is a stamp honoring Wayne’s friend, director John Ford. Wayne appears on that stamp in the closing scene from The Searchers. John Wayne won the People’s Choice Award for Most Popular Motion Picture Actor in 1976. The award was presented by his close friend Maureen O’Hara. In 1924, John Wayne was initiated into DeMolay (a Masonic organization) in Glendale, California. He received the DeMolay Legion of Honor in 1970. On November 13, 1986, John Wayne was inducted into the DeMolay Hall of Fame – one of the first to be awarded that honor. In 1973 John Wayne was awarded the Gold Medal from the National Football Foundation. In 1974, Wayne was inducted into the Hall of Great Western Performers in the National Cowboy and Western Heritage Museum. He was voted the fifth greatest movie star of all time by Entertainment Weekly, and the fourth greatest movie star by Premiere Magazine. He ranked number 13 on the list of actors on the American Film Institute’s 50 Greatest Screen Legends. In 1980 he was awarded the Presidential Medal of Freedom, the nation’s highest civilian honor, by then President Jimmy Carter. In September 1964,Wayne was admitted to Good Samaritan Hospital in Los Angeles, California to have a cancerous lung removed. Fearing the surgery would lead to a loss of film roles and fan base, Wayne’s producers and publicists concocted the story that he was only being treated for lung congestion. When he was visited by Hollywood columnist Jim Bacon, Wayne complained that his producers only cared about box office receipts, told Bacon the real reason for his hospitalization and insisted that the columnist tell the truth about Wayne’s cancer. After his release from the hospital, Wayne held a press conference and in spite of his producers wishes, he told the reporters that he had “licked the Big C.” After the story broke, thousands of cancer victims and their relatives wrote to Wayne saying that his battle against cancer had given them hope that they previously did not have. When John Wayne died on June 11, 1979, the Olympic Torch at the Los Angeles Coliseum was lit in honor of his memory. The torch remained lit until his funeral four days later. John Wayne’s grave remained unmarked after his death, as his family was concerned that someone may try to damage or desecrate his final resting place. In 1999, his grave finally received a plaque. Eighteen years after his death, John Wayne ranked #16 in Empire magazine's "The Top 100 Movie Stars of All Time" list. As with most (if not actors in Hollywood), there were several roles throughout John Wayne’s career that he either wanted and did not get, or was offered that he turned down. There were also some roles, including some of his best, for which he was not the first choice for. What follows is a brief list of some of those roles. John Wayne was offered the role of Major Reisman in The Dirty Dozen, but turned it down, reportedly because he thought the movie depicted the military in a bad light. The role went to Lee Marvin, who appeared in three films with Wayne: The Comancheros, Donovan’s Reef, and The Man Who Shot Liberty Valance. Director Michael Cimino originally wanted John Wayne for the role of James Averill in his project Johnson County War. Wayne turned the role down, and Cimino went on to make The Deer Hunter instead. When Wayne made his last televised appearance on the 1979 Academy Awards show, he presented the Best Picture Award for The Deer Hunter (a film which Wayne did not care for). After Wayne died, Cimino went back to work on Johnson County War and cast Kris Kristofferson in the role he originally offered to Wayne. Cimino renamed the film Heaven’s Gate, and the film was a box office bomb. Although Wayne actively campaigned for the role of General Patton in the film Patton, the film’s producer turned him down and the role went to George C. Scott. This was not the only time Scott and Wayne competed for a particular film role. Mark Rydel wanted George C. Scott for the role of Wil Anderson in The Cowboys, mainly because he did not like John Wayne’s politics, and Don Seigel originally offered the role J.B. Books in The Shootist to Scott as well. Wayne, of course, ended up turning in Oscar winning performances in both rolls. John Wayne was not the first choice to play Mongol warrior Genghis Khan. In fact, the role was actually written for Marlon Brando. Brando refused to do the film and the part went to Wayne who asked for the role. Not only is the film considered to be one the worst (if not the worst) of all of John Wayne’s roles, there is speculation that his work on the film contributed to the cancer that eventually took his life. Wayne was also not the first choice for the role of Dan Roman in the William Wellman classic aviator film (and the first of the big budget all-star cast airplane disaster films). The role was originally offered to Spencer Tracy, who actually signed on for the part. After learning of director Wellman’s legendary hard-nosed reputation, however, Tracy backed out, and Wayne was forced to take over the lead. The film became one of Wayne’s best. Even as producer, John Wayne did not always get whom he wanted in a role. For example, in The Alamo, Wayne (who was producing and directing) wanted only the small role of Sam Houston. United Artists, who was putting up half of the money for the film, insisted that he take on the much larger role of Davy Crockett as a stipulation for their support. For the role of Capt. Wilder in Blood Alley, also produced by John Wayne, Wayne had signed Robert Mitchum. Apparently Mitchum was involved in a scrap with the film’s director William Wellman, and Wellman ended up being pushed or thrown into San Francisco Bay by Mitchum, who was thrown off the set as a result. In order to save his film, Wayne tried to bring on Humphrey Bogart to take over as Wilder, but Bogart was unable to take the role, so Wayne ended up casting himself. After completing The Shootist, John Wayne had a script commissioned for him called Beau John, where he would co-star with Ron Howard, but the film was not made because of Wayne's ill health. Although he accepted the role of Carl Barber in the romantic drama Welcome to L.A. (1976), production delays and budget overruns kept Wayne out of the picture. Wayne’s role eventually went to his frequent co-star Denver Pyle. 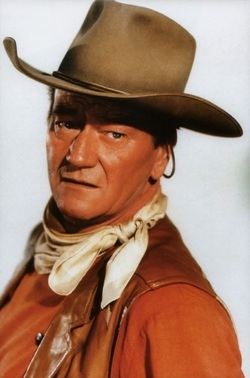 John Wayne was the first choice for the role of “Dirty” Harry Callahan in the film Dirty Harry. Wayne turned it down (and so did Frank Sinatra). The role eventually went to Clint Eastwood, and it became one of his signature roles. Wayne later regretted not taking the role. That regret turned into Brannigan and McQ. Steven Spielberg says he had Wayne read the script for 1941 in hopes he would play Gen. Stilwell. Wayne turned down the part saying it was in bad taste to make fun of WWII. The role eventually went to Wayne’s one-time co-star (in The High and The Mighty) Robert Stack. Wayne was offered the role of Major T. J. “King” Kong in the satirical classic Dr. Strangelove. Wayne did not respond to an offer and the role went to Slim Pickens. 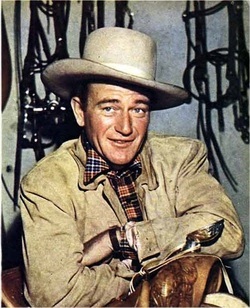 John Wayne was also offered the part of Willie Stark in All The King’s Men by director Robert Rossen. Wayne turned it down and the role went to Broderick Crawford. When author Larry McMurtry originally wrote his masterpiece Lonesome Dove, he envisioned the book being made into a movie starring John Wayne, James Stewart, and Henry Fonda. McMurtry wanted Wayne in the role of Woodrow Call, the role later made famous by actor Tommy Lee Jones. Wayne was approached to take the lead role of General Savage in Twelve O’Clock High. Wayne turned down the part, and it went to Gregory Peck who earned a Best Actor nomination for it. For many years, John Wayne tried in vain to acquire backing for the Noel Coward play Present Laughter. He wanted to do the comedy as a change of pace from his usual roles, but he was unsuccessful in his attempts to find a producer. Gene Wilder states in his autobiography that the role of Tommy Lillard in the film The Frisco Kid, was originally offered to John Wayne. Wayne was interested in the part, however, the producers were not willing to pay Wayne’s standard fee. The role eventually went to Harrison Ford. In 1939, John Ford was looking for a producer to back his new western, Stagecoach. Legendary Hollywood producer David O. Selznick was ready to finance the film, but he wanted Gary Cooper in the role of The Ringo Kid, and Marlene Dietrich in the role of Dallas. Ford refused Selznick’s casting choices, and later made the film with backing from Walter Wanger, with John Wayne and Claire Trevor in the lead roles. And the rest, as they say, is history.